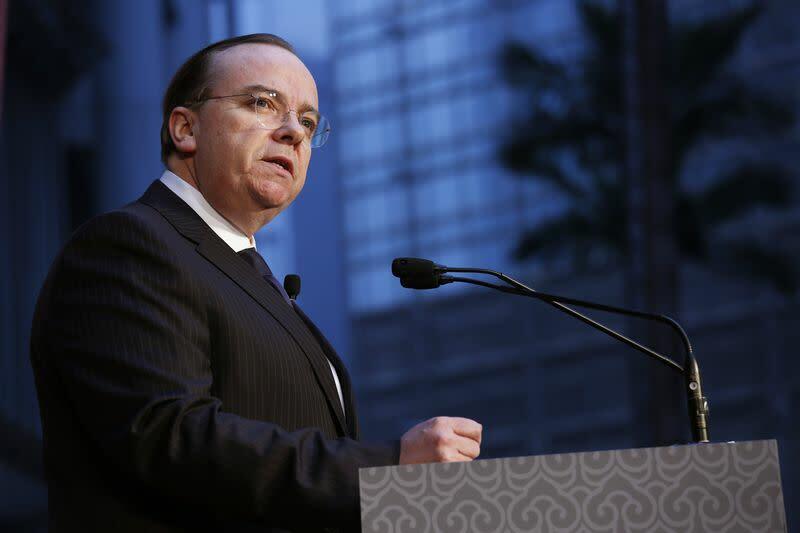 LONDON (Reuters) - HSBC (HSBA.L) Chief Executive Stuart Gulliver said he was the right person to run Europe's biggest bank and fix problems of the past after British lawmakers berated it for allowing "industrial-scale tax avoidance" at its Swiss arm. Gulliver faced more than two hours of hostile questioning from the lawmakers on Monday, along with a former head of HSBC's private banking and one of its non-executive directors, over a tax evasion scandal that has rocked the bank. The CEO's personal financial affairs have added further fuel to the row over whether the bank helped clients dodge taxes after Britain's Guardian newspaper said he had sheltered millions of pounds in HSBC's Swiss private bank via a Panamanian company. Gulliver said that did not undermine his role. "I believe I am (the right person to be CEO) because my tax affairs are in order and I have carried out widespread root-and-branch reforms of HSBC in the five years I have been group CEO," he told lawmakers on parliament's Public Accounts Committee. He said whether he remained as CEO was a matter for the board and shareholders. "I am committed to finishing what I began five years ago in a firm that I've served for 35 years." The CEO admitted scrutiny of his own affairs had damaged the bank, however. "My inability to convince anyone that these arrangements were not put in place for reasons of tax evasion have caused reputational damage to the bank. But the fact is I've complied with the tax laws," he said. HSBC has admitted failings in controls at its Swiss private bank following media reports that it helped wealthy customers conceal millions of dollars of assets in a period up to 2007, but has said it has transformed its operations. "This is tax avoidance on an industrial scale," said Margaret Hodge, chair of the Public Accounts Committee. Argentina piled on more pressure on Monday, saying it wanted the bank to repatriate $3.5 billion (2.3 billion pounds) that it says it helped move offshore to help clients evade taxes. Gulliver said an area that had been cleaned up were so-called "hold mail" accounts, where a bank is told not to send statements and other correspondence to where the client lives. He said there was "a higher probability" that such accounts "indicate areas of concern" in regard to spotting tax evasion or avoidance, and he said the bank now only had 12 such accounts, from almost 15,000 in Switzerland in 2012. Hodge was most critical of Chris Meares, who ran HSBC's global private banking division for several years up to 2011, and Rona Fairhead, a non-executive director since 2004. Hodge said Fairhead should quit as chairwoman of the BBC Trust, or be fired by the British government, following her testimony on Monday. Fairhead said she was horrified at the allegations of tax avoidance. She "categorically" denied that she knew anything about tax evasion and said she had put in place many of the corrective measures at the bank since 2011. The Swiss tax scandal has added to a list of problems from the past that have hit HSBC in recent years. The bank was fined $1.9 billion two years ago by U.S. authorities for lax controls that allowed criminals to launder money and was also hit with a $611 million penalty by regulators in November for alleged manipulation of currency markets. Gulliver said many of HSBC's problems stemmed from a series of acquisitions in the early 2000s, when the bank tried to diversify from an over-reliance on Asia but became too big and complex. "We had an organizational structure that in essence was out of date and (there were) multiple acquisitions that diluted the DNA of the bank," he said.